In the second of two days focusing on the craft of nonfiction filmmaking, we dive deep into all aspects of documentary cinematography. BREAKFAST 9:00 AM-10:00 AM Open to all badge holders. Jeff Orlowski, the director of Chasing Coral and Chasing Ice is known for his stunning cinematography. Hear how he captures such incredible images. Open to all badge holders on first-come basis. 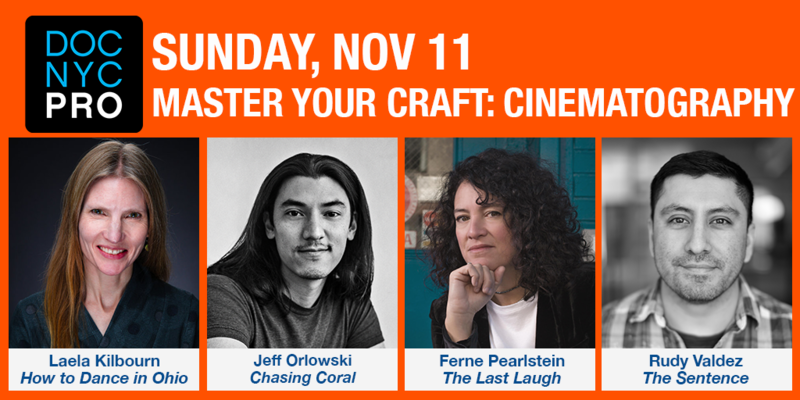 Cinematographers Claudia Raschke (RBG), Erik Shirai (Blowin’ Up), Nara Gerber (Flat Daddy) and Wolfgang Held (The Fourth Estate) discuss working against the clock, shooting in challenging environments, and what techniques you can use to get what you need. Moderated by Zach Levy (Strongman). Cinematographers Tom Hurwitz (Studio 54), Ferne Pearlstein (The Last Laugh), Soraya Selene (Half The Picture) and others discuss techniques for creating the best environment to capture captivating subject interviews. Moderated by Colin Nussbaum (An Inconvenient Sequel: Truth to Power). Cinematographer Rudy Valdez (The Sentence), Laela Kilbourn (This Is Home: A Refugee Story), Iris Ng (Shirkers), and Ryan Scafuro (Phantom Cowboys) discuss objectivity and subjectivity in observational filmmaking. Moderated by Amir Husak (The New School).